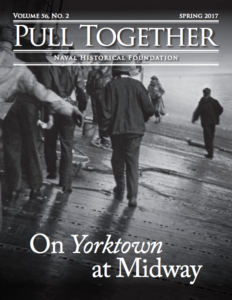 In 1999, the Chief of Naval Operations sent a message to the fleet directing the annual commemoration of two significant events in our proud naval history—the birth of our Navy on 13 October 1775, and the U.S. Navy’s World War II victory at Midway from 4 to 7 June, 1942. Each year, Navy commands around the world gather to remember the service and sacrifice of those who wrote what Admiral Chester W. Nimitz rightly called “a glorious page in our history.” And what led to that victory? The Battle of Midway, fought near the Central Pacific atoll of that name, is considered to be one of the most decisive battles of World War II in general and of the Pacific campaign in particular. From a vantage point of nearly 75 years, we look back at Midway as more significant than simply a strategic victory which, as part of a grueling campaign from the battle of the coral sea through the successful capture of Guadalcanal, turned the tide in the Pacific. Historians have suggested that Midway had a broader impact on the outcome of World War II as well as the geo-political configuration of Cold War Europe. 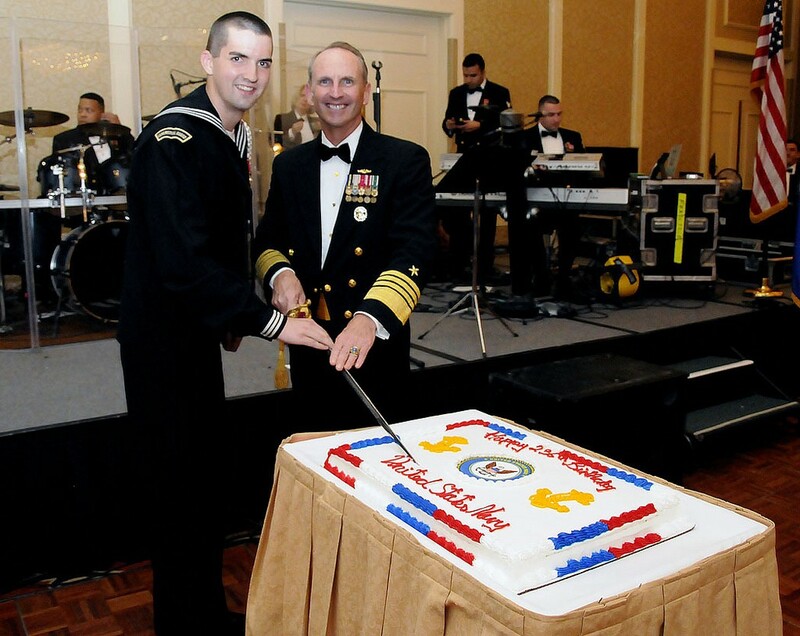 From 1999 through 2005, the Commandant, Naval District Washington hosted, organized and ran the annual birthday celebration. In 2006, after a series of meetings between representatives of NDW and National Capital Council Navy League (NCCNL) and Naval Historical Foundation (NHF), NCCNL agreed to host the event including issuing invitations, coordinating RSVPs, contracting with the hotel venue, developing the evening sequence of events, inviting senior Navy leadership, printing programs, etc. NHF agreed co-host the event with a role of providing an annual historic theme for the event, including displaying appropriate historic images and sometimes producing a video about that theme. NHF-sponsored themes have included: Victory in the Cold War; Centennial of the Great White Fleet; Honoring Navy Individual Augmentees in Iraq and Afghanistan; 40th Anniversary of Apollo 11 and Navy in Space; Naval Aviation Centennial; Civil War Sesquicentennial; War of 1812 Bicentennial. Beginning in 2013, the national headquarters of the Navy League of the United States assumed the event coordination duties for the Navy. Each year, on or close to the U.S. Navy’s Submarine Force 11 April Birthday the Naval Submarine League, with the Naval Historical Foundation and the Naval History and Heritage Command as co-sponsors, produces a Submarine History Seminar in the Washington, DC area. Venues have included the U.S. Navy Memorial’s Naval Heritage Center and the National War College. The evening event includes refreshments, the presentations detailed below, and a ceremonial Submarine Force Birthday cake cutting. Biographer Frank Duncan discussed the youth and early career of Admiral Rickover followed by commentaries by his successors, Admiral Kinnaird McKee, USN (Ret. ), Admiral Bruce DeMars, USN (Ret.) and Admiral Frank L. “Skip” Bowman, USN. Four papers covering aspects of Beach’s life were presented by VADM Al Konetzni, USN; Capt. Jim Hay, USN (Ret. ); author Paul Stillwell; and USNA English professor Fred Fetrow. Comments on Captain Beach’s legacy were offered by Naval History Director William Dudley; VADM J. Guy Reynolds, USN (Ret. ); former MCPON John Hagan, USN (Ret. ); and son Edward A. Beach. Three papers were presented by Naval Historical Center historian Gary Weir; Capt. Jack Crawford, USN (Ret. ), an engineer at Naval Reactors through the development period; and VADM Kenneth Carr, USN (Ret.) a member of the first Nautilus wardroom, on the construction of Nautilus and her impact on naval warfare. Three presentations covered the use of submarines as Special Forces delivery platforms. CDR Phil Eckert, USN (Ret.) who served in USS Argonaut, described her raids in World War II, early Cold War operations were detailed by Col. John Ripley, USMC, (Ret.) and current and future capabilities were discussed by Capt. Rick Ruehlin, USN. Three presentations covered the 50 year history of the Strategic Systems Programs. RADM Robert Wertheim, USN (Ret.) addressed the early years of the program; VADM Kenneth C. Malley, USN (Ret.) covered the development of Fleet Ballistic Missile Program leading to the Trident Missile; and RADM Charles Young, USN dealt with recent events and current issues. VADM Roger Bacon, USN (Ret. ), former DCNO for Submarine Warfare; RADM Thomas Brooks, USN (Ret. ), former Director of Naval Intelligence; and Mr. Richard Haver, former Deputy Director of Naval Intelligence, spoke about surveillance and reconnaissance operations by USN and allied submarines. VADM Ken Carr, USN (Ret.) spoke about the Nautilus first polar cruise; CAPT Merrill Dorman, USN (Ret.) 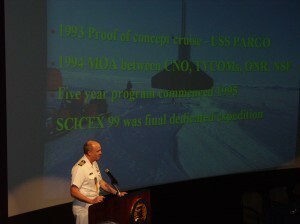 covered several decades of arctic operations history; and CAPT Robert Perry, USN detailed recent such operations. CAPT Peter Fullinwider, USN (Ret.) spoke about Regulus missile operations; RADM Walter Locke, USN (Ret.) covered the early years of submarine launched cruise missiles; Ambassador Linton Brooks (CAPT, USN (Ret.) dealt with submarine launched cruise missile policy. CAPT William Manthorpe, USN (Ret. ), former Deputy Director of Naval Intelligence moderated the seminar. RADM Thomas A. Brooks, USN (Ret. ), former Director of Naval Intelligence spoke about the “sensing” of the Ocean Surveillance Information System (OSIS); “fusion” was covered by CAPT James Donovan, USN (Ret. ), former commanding officer of Naval Ocean Processing Facility Dam Neck, describing the Sound Surveillance System (SOSUS); and RADM Eric A. McVadon, USN (Ret. ), former Commander, Iceland Defense Force spoke about Cold War maritime patrol aircraft exploitation of the information gathered on Soviet submarine operations. Led by moderator CAPT Pete Boyne, former Deputy Director of Strategic Systems Programs (SSP), a distinguished panel discussed the concept, development, and operational deployment of the SLBM nuclear weapons deterrent. The panel consisted of Mr. Franklin Miller, Former Senior Director for Defense Policy and Arms Control, National Security Council; VADM Jerry Miller, USN (Ret), author of “Stockpile” and “Nuclear Weapons and Aircraft Carriers” and former Deputy Director Joint Strategic Target Planning Staff; and Mr. Phillip Lantz, founder, President and CEO of Systems Planning and Analysis, Inc. The 2012 Submarine History Seminar was held on the evening of 24 April 2012, as part of the National War College Commandant’s Lecture Series in historic Roosevelt Hall at the War College’s Fort McNair campus in southwest Washington, DC. 2012 marks the 11th year that the Naval Historical Foundation has partnered with the Naval Submarine League and the Naval History and Heritage Command to stage these compelling looks back at the U.S. Navy’s submarine force in war and peace. The seminar took an in-depth look back at the intensive effort in the 1970s and 1980s to develop over-the-horizon (OTH) targeting methods needed to ensure that newly developed HARPOON and TOMAHAWK cruise missiles could be employed reliably to their full range potentials. CAPT Lynn Wessman, USN (Ret. ), who served as project officer for OUTLAW SHARK at Submarine Group Eight in Naples, Italy in the late 1970s. The audience of nearly 70 active duty and retired Navy personnel, plus eight midshipmen of the Naval Academy’s Dolphin Club, listened with rapt attention to the participants’ descriptions of the U.S. Navy’s ultimately successful effort to target the Soviet Navy before they were able to develop the same capability to target USN ships. The seminar was preceded by food and refreshments sponsored again this year by the Northrop Grumman Marine Systems office. On 11 April 2013, nearly 120 guests attended the Submarine History Seminar in the Navy Museum’s Cold War Gallery to hear how the U.S. Navy’s posture changed from the Carter years of being a reactionary one that assumed the Soviet Navy would replay the role of the Germans in fighting a Battle of the Atlantic III, to a proactive strategy during the Reagan years that aimed at attacking Soviet ballistic missile submarines at the onset of war. A key was a realization by American Navy leaders that the Soviets had little interest in using their submarine forces to interdict allied operations in the North Atlantic. This shift in American thinking on how to employ forces in a general war with the Soviet Union became known as “The Maritime Strategy” and the Seawolf submarine, of which only three were built, was designed as a big, fast, quiet, torpedo-laden weapon system that could effectively operate in hostile waters. Did any technical development or acquisition requirement stem from a policy decision or strategic direction? What if any tactical operational results or requirements influence policy decisions or strategic direction? If the policy or strategy directions did not specifically influence the Seawolf design, what or who made the design tradeoffs and decided the ship’s characteristics? How much, if any, did the Maritime Strategy fundamentals influence the deployments and operations of submarines in the rest of the Cold War? (Before and after open publication). When did the Soviets recognize any vulnerability to the Maritime Strategy? Did that recognition reach their national leadership? Was the Maritime Strategy ever acknowledged by Office of the Secretary of Defense (OSD) or political leaders of the Administration (other than Secretary Lehman)? Did the strategy have any impact on these civilian officials or was it simply an internal/external Navy document? How influential was the Maritime Strategy on the design and acquisition of ships and weapons? (Seawolf as the anti-bastion cracker, expansion of MPA, deployment of S3, creation of Aegis). Did the long term on-going submarine operations themselves influence the Maritime Strategy? 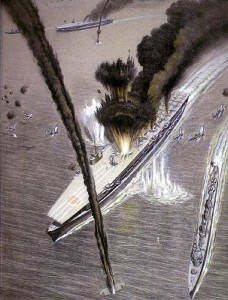 In the actual plans that reflected the Maritime Strategy, submarines were seen as the leading edge of the assault on Soviet Navy. When was this offensive concept extended to other parts of the Navy? (i.e. Exercise Northern Wedding). To address the questions, three distinguished individuals, with moderator RADM Jerry Holland, USN (Ret.) discussed the design of Seawolf and the evolving thought process that led to the Maritime Strategy. RADM Millard S. Firebaugh, USN (Ret.) served as an engineering duty officer and was assigned to the Naval Sea Systems Command during the early 1980s. There he initiated the Seawolf Class submarine program which he managed through design and award of contracts for the first two ships of the class. CAPT Peter Swartz, USN, (Ret.) served in the Navy as a General Unrestricted Line Officer, worked in the Chief of Naval Operations and Secretary of the Navy’s staffs in the 1980s, contributing to the development and dissemination of The Maritime Strategy. Ambassador Linton F. Brooks has over five decades of national security experience, much of it associated with nuclear weapons and deterrence. As an active duty Navy captain he served on the Navy staff and the National Security Council staff in the 1980s, where he has active in shaping and promoting the Maritime Strategy. The theme of the evening’s event was “A Century of United States Navy Torpedo Development.” Seminar speakers represented the current leaders and recognized historians on the subject from the Navy, industry, and academia. Approximately seventy guests enjoyed a night of information, birthday celebration, and commemoration. The 3 April event marked the second seminar held in the Cold War Gallery of the National Museum of the United States Navy at the Washington Navy Yard. This year’s seminar recognized the accomplishments of longtime chair and moderator, Rear Admiral William J. Holland, Jr., USN (Ret.). The seminar ran under his tutelage since the Naval Historical Foundation joined as a co-sponsor with the Naval Submarine League in 2002. Over a decade of successful seminars later, Admiral Holland passed the reins to author, analyst, historian, and retired Reserve intelligence Captain, Dr. David A. Rosenberg, USN (Ret.). Moderated by Dr. David A. Rosenberg, the panelists below discussed the history of torpedo development over the last century. Dr. Katherine C. Epstein is an Assistant Professor of History at Rutgers University-Camden. She is the author of Torpedo: Inventing the Military Industrial Complex in the United States and Great Britain. Ms. Kate Morrand is the Senior Conservator and Manager of the Underwater Archaeology branch of the Naval History and Heritage Command. Dr. Edward Liszka is the Director of Pennsylvania State University’s Applied Research Laboratory. Captain David Ogburn, USN is Undersea Weapons Program Manager, Program Executive Officer Submarines (SUBS) PMS 404 Naval Sea Systems Command. The theme of the evening’s event was “A Half-Century of US-UK Submarine Cooperation.” Seminar chair and moderator Dr. David Rosenberg built on the success of last year’s Sub History Seminar on torpedoes. Focus this year centered on missile technology and nuclear propulsion plant development between the United States and United Kingdom, namely POLARIS and TRIDENT and the one man unquestionably connected to the Nuclear Navy in both countries, Admiral Hyman G. Rickover. Many of the speakers at the Submarine History Seminar this year had first-hand experience coordinating US and UK submarine development from the U.S. Navy and Royal Navy’s nuclear reactor and missile programs. Attendees had the rare treat to hear behind-the-scenes insight of the modern nuclear submarine by some of the most influential leaders in the field. Approximately one-hundred guests enjoyed a night of information, birthday celebration, and commemoration. The 15 April event marked the third seminar held in the Cold War Gallery of the National Museum of the United States Navy at the Washington Navy Yard. Moderated by Dr. David A. Rosenberg, the panelists below discussed the half-century relationship between the United States and United Kingdom with regard to submarine technology and weapon development. WJR “Jock” Gardner is a former Royal Navy submariner who specialized in antisubmarine warfare. He is currently the historian in the Naval Historical Branch of the United Kingdom Ministry of Defence. Vice Admiral Sir Robert Hill, RN (Ret.) is a former engineer officer in the Royal Navy who served as the Director of Nuclear Propulsion at the end of his career. Admiral Bruce DeMars, USN (Ret.) is the former Director, Naval Reactors, and currently serves as the Chairman of the Naval Historical Foundation. Rear Admiral John T. Mitchell is a former Director, Strategic Systems Programs (SSP), and currently serves as the President of the Naval Historical Foundation. 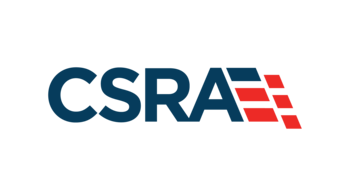 Ms. Elizabeth Bahr is a Supervisory Associate Counsel for International Law and Arms Control Compliance and Implementation for the Department of theNavy General Counsel, Strategic Systems Programs (SSP), in Washington, D.C. This 2016 program built on last year’s seminar which focused on US-UK strategic missile and submarine development and cooperation over the course of fifty years. Part of that cooperation over that time period included the development of the POLARIS, POSEIDON, and TRIDENT missile systems, which were featured prominently on the “41 for Freedom” boomers before their retirement. Moderator Dr. Rosenberg envisioned presenting attendees with a well-rounded approach to understanding­­ the vast and multifaceted world of ballistic missiles – from their creation and construction to the maintenance and performance of the Navy’s great underwater force for peace. Unlike previous seminars, several presentations were recorded before the event ­due to the rigors of travel for our speakers to and from the Washington Navy Yard. The formal presentations opened with a brief video explaining the historical antecedents of the Fleet Ballistic Program from the point of view of the organization tasked with creating the weapon system itself, Special Projects, now the Strategic Systems Programs office. Dr. David Rosenberg next educated attendees with background to the Navy’s POLARIS missile as a weapon of deterrence and its inclusion in the FBM program under the direction of Admiral Arleigh Burke. The next presentation came from a recorded oral history interview with former shipbuilding supervisor Captain Patrick G. O’Keefe (Ret.) and former ship superintendent of Portsmouth Naval Shipyard Rear Admiral Millard S. Firebaugh, USN (Ret.). O’Keefe and Firebaugh approached the history of the “41 for Freedom” ships from a construction, maintenance, and modernization perspective. Both men played a heavy hand in each integral part of the SSBN life cycle. Captain James C. Hay, USN (Ret.) discussed the performance of the “41 for Freedom” submarines from the command and operational perspective over the course of his illustrious career in his video interview.